The economic expansion is expected to continue. Economists see few worrisome signs in the current data. However the economy is poised to enter into a different phase of the business cycle in 2018. Continued low levels of inflation are likely one indication that the U.S. has yet to really reach its current capacity, or reach full employment even if the unemployment rate is quite low. However, the economy is likely to begin to run into supply side constraints in the near future and how the economy adjusts, and how policymakers react to these changes will go a long way toward determining when the expansion ends. That said, the U.S. economy is beginning to hit the sweet spot like Oregon has in recent years. Employment and participation rates are rising some and wages continue to pick-up. As such household incomes are growing and poverty rates are falling. Oregon continues to transition down from peak growth rates seen a couple years ago to a more sustainable, long-term rate. However the latest population estimates indicate that migration trends have yet to slow thus far. Expectations are for population growth to taper in the short-term, in keeping with the economy. 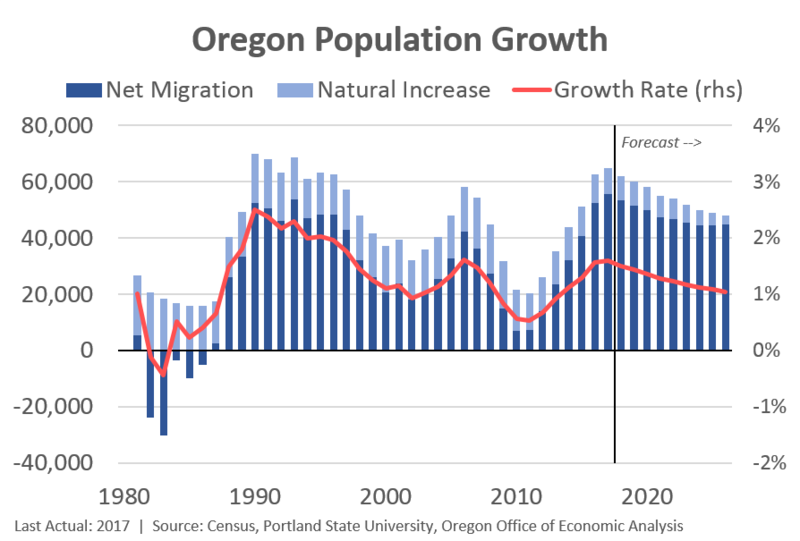 Moving forward, Oregon’s population growth will increasingly rely on migrants. Oregon’s primary General Fund revenues continued to grow over the first few months of the 2017-19 biennium. Although this growth was healthy, exceeding what was seen in most states, collections have come in slightly lower than what was called for in the September forecast. However, recently processed personal income tax returns for filers with extensions and amendments suggest taxable income is likely larger than was previous estimated. The net result is a relatively unchanged General Fund forecast. Combined, the total resources from the General and Lottery Funds have increased $47.4 million relative to the September outlook. The majority of the increase comes from a stronger corporate tax outlook. The primary risk facing the near-term revenue forecast is the potential for tax legislation at the federal level. From a broader economic perspective, the most significant local impact of federal tax changes will be what happens to the amount of federal taxes paid by Oregon’s households and businesses. However, in addition to what happens to the federal tax bill, many federal law changes stand to have larges impact on Oregon’s own revenue streams. Oregon’s tax collections are tied to federal tax law both directly and indirectly. The starting point for calculating Oregon income tax is taxable income from a filer’s federal return. As a result, most federal changes to what is defined as income, or to what can be deducted or excluded from it, directly feed into Oregon tax collections. After the last major federal tax reform in 1986, Oregon’s income tax revenues increased 20% the following year. The most recent proposals call for increasing the standard deduction, while eliminating a range of itemized deductions. Changes to the standard deduction only impact Oregon tax collections indirectly, while changes to itemized deductions can also directly flow into Oregon collections. Oregon defines its own standard deduction levels, disconnecting its revenues from the federal policy. 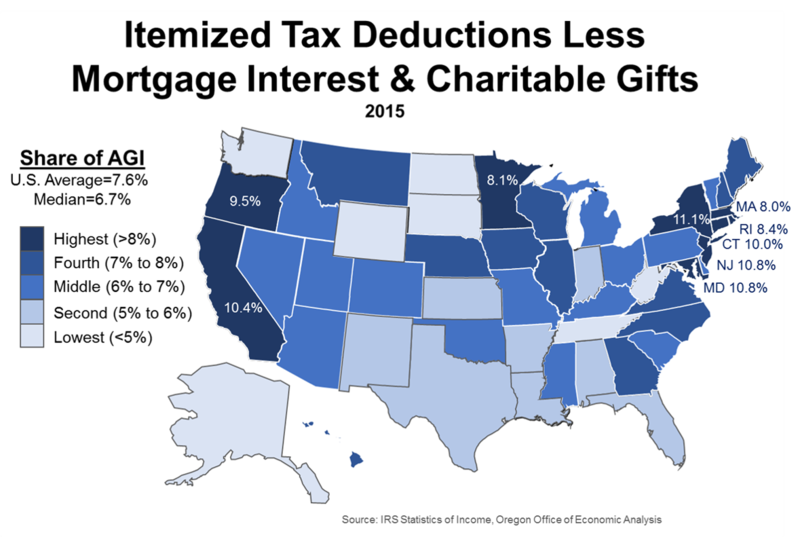 Itemized deductions are where much of the uncertainty lies for both Oregon’s taxpayers and its state revenues. Oregon filers, high and low income alike, itemize at higher rates than the national average. Oregon’s taxpayers are able to claim a relatively large amount of deductions, in part due to a large amount of state income taxes paid. As is always the case regarding tax policy, the devil is in the details. Federal tax reform has not yet passed, with amendments and revisions likely still to come. Initial rough estimates by the Oregon Department of Revenue and Legislative Revenue Office suggest that the upward pressure created by federal reform could be large enough to trigger Oregon’s unique kicker law all else being equal.